Patterson Hybrid Onion | Gurney's Seed & Nursery Co. 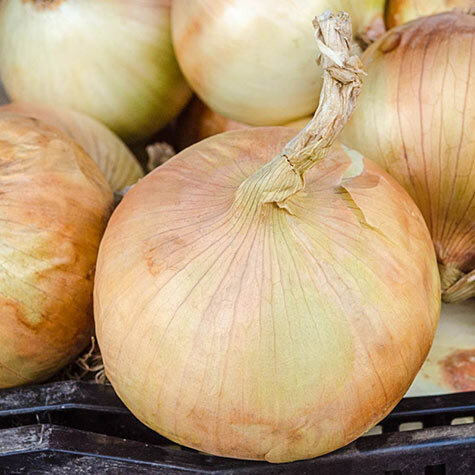 This sweet, firm onion has straw-colored skin and yellowish flesh that matures into a very uniform shape and size. Similar to Copra, yet slightly larger with an overall higher-yield, Patterson has an extremely long shelf life allowing for months of fresh, flavorful eating! 104 DAYS. Spacing: 5 - 6 inches between plants. Depth: Seeds: 1/2 inch. Start seed indoors, in late Winter, 8 - 10 weeks before setting outdoors. Set outdoors as soon as the soil can be worked. Plant 1 inch deep. Fruit: 4 oz hard yellow storage onions. Comments: This sweet, firm onion has straw-colored skin and yellowish flesh that matures into a very uniform shape and size. Similar to Copra, yet slightly larger with an overall higher-yield, Patterson has an extremely long shelf life allowing for months of fresh, flavorful eating!